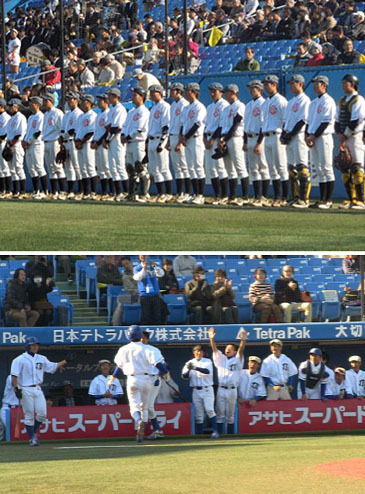 To celebrate the 150th Anniversary of Meiji Gakuin University (MGU), its baseball club (established in 1885) hosted a commemorative match with the University of Tokyo (UOT) baseball club at Meiji Jingu Baseball Stadium on Sunday November 24, 2013. The first match in 1890 between MGU and the First Higher School (Ichiko), the predecessor of UOT, was marred by the so-called “Imbrie Affair” in that Ichiko Students assaulted professor Imbrie, an American missionary of MGU, because he climbed over a hedge to gain admittance during the game and the game was called owing to the disruption in the 6th inning when MGU was leading 6-0. The U.S. Embassy protested against the incident leading to an official apology from Japan’s Foreign Ministry and Ichiko representatives and the good professor granted forgiveness. Ichiko ball club, which felt humiliated by the defeat conducted legendary fierce training thereafter, winning a rematch against MGU by 26-2 and reigned over predawn era of Japanese baseball for some time. The two college teams on last Sunday dressed in uniforms and caps of their ancestors and the game ended with MGU won 3-1 over UOT.